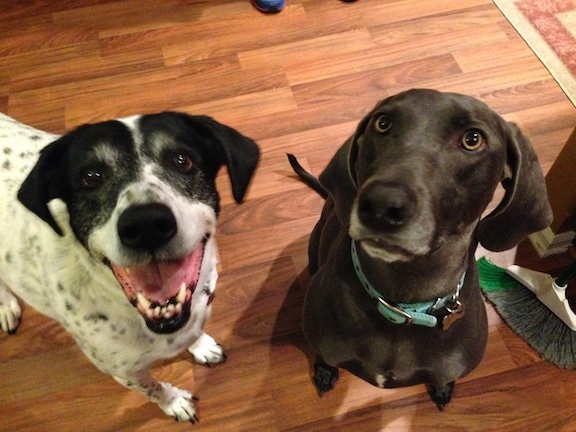 Marvin is a 4 year old Weimaraner rescue, pictured here on the right with one of his room mate a GSP mix named Christina. Their owner called me in to stop Marvin’s habit of nipping and biting hands of people, lack of manners and over excitement when guests arrived. When I arrived for the session Christina met me warmly at the door, but one of Marvin’s owners was holding him back, 15 feet from the door. Marvin was barking excitedly, but not aggressively. Often times a dog will bark out of frustration of not being able to fully sniff a human or dog they see. After giving him a moment, I approached Marvin and took a non confrontational position near him so that he could give me a sniff. His barking subsided a bit, so I offered my hand which was promptly bit by Marvin. It wasn’t a hard bite, more of an aggressive mouthing and he let go as soon as his teeth touched my skin. Because he stopped immediately and didn’t show any signs of aggression, Im pretty certain that Marvin “bit” my hand due to being overexcited. This is similar to a young boy who first becomes interested in a girl in first grade. He likes Sally, but doesn’t know how to express himself so he punches her in the arm. This is what he does to his friends and applies it to her as it is the only way he knows to express himself. I suggested that his owners not allow Marvin to interact with any guests any time he is over excited. Before our session, they had simply taken Marvin to another room when guests arrived. While this ensures no bite will happen, it doesn’t give Marvin the ability to grow and develop a new way of expressing himself. By allowing Marvin to participate in meeting guests, in a controlled way, we can help him learn that he only gets to meet and interact with new people after he calms down. I suggested that his family place a leash around one of the legs to the heavy dining room table as its near the front door to the home. By placing Marvin on a tethered leash when guests arrive, his owners will be able to relax themselves which should have a calming effect on the dog. Only after Marvin has calmed down should they take him on the leash over to meet any visitors. Next I went over a few leadership exercises with both dogs, but after a few moments, it became clear that they were lacking in confidence. Any time they were challenged in the slightest way, they would move as far away as possible. It took a considerable amount of coaxing to get them to come to me to get a high value treat, and each time they immediately retreated back away after getting the snack. Whenever I work with dogs lacking in confidence, I like to employ the “recall” exercise. I have the members of the family arrange themselves in a large circle, then we take turns calling the dog to come to us. Each time it does, we give it a high value treat as a reward. We started out with Christina who began things very hesitantly, requiring us to call her repeatedly to come to us. She was stiff, moved slowly, avoided eye contact, and required quite a bit of encouragement to come to get her reward. But as we continued, you could see her starting to build up confidence once she understood the exercise. Within 5 minutes she was happily bounding to whomever called her on the first call. We repeated the exercise with Marvin with similar results. I suggested that the family practice this exercise with all the dogs in the home until they respond immediately and without any hesitation. I also mentioned that they may want to practice it when guests arrived so that they dogs learn that its good and rewarding to come when called, even to new people. By the end of the session, the dogs were very calm, maybe too calm. They laid on the floor at our feet as I offered some parting instructions before leaving. By limiting them any time they get over excited, and practicing basic commands and leadership exercises, the dogs will gain confidence in themselves as well as develop social skills. This behavioral foundation will eliminate most of their minor issues immediately, and with time and practice, should stop the nipping and biting issues as well.